Home › Construction Spanish › They speak Spanish… they’re not deaf. They speak Spanish… they’re not deaf. I’ve got a volume problem. Yesterday the volume on my car stereo began to “take the wheel,” so to speak. At the stereo’s discretion, the volume will drift from a normal listening level… down to silence. As it happens, I find myself imperceptibly angling my right ear to the stereo while leaning my entire head towards the steering wheel. But not as annoying as the opposite…. 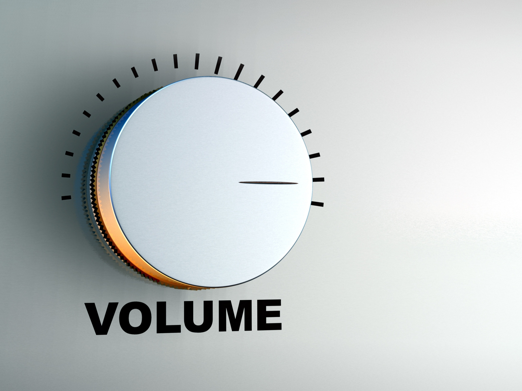 Sometimes the volume increases rapidly from normal to DEAFENING. In this instance I quickly smack the entire volume knob, shutting the stereo off completely. The surprise comes when I turn it back on. It can literally be at any level. It’s quite the fun little game between me and my car. This subtle problema got me thinking about the role of volume in speaking Construction Spanish. Whether you’re using your micro-fluency Spanish skills to sell more construction gear or improve safety or clean up the site – the volume you choose is important. As you plan to speak what Spanish you know, your heart rate quickens. Sweat emerges from your brow. Because of this, the language often comes out quickly & softly. That’s a bad combination for any message. Try to establish eye contact before speaking or throw an ¡Oye! (Hey!) on the front end of your sentence. Then come out with it at an even pace and an appropriate volume. On the other end of the spectrum, don’t yell. I’ve seen dozens of instances where speakers pretend they’re dictating to a hearing impaired 2-year-old. CAN!…. YOU!…. MOVE!.… THIS…. REBAR!…. POR!…. FAVOR!? So watch your volume while speaking. And I’ll watch mine while driving. And if we happen to speak on the phone while I’m in my car… beware. Please share this post with all the loud-talkers in your network! ‹ 9 quick ways to avoid making eye charts (unless you’re an eye doctor). Great post! Sorry to hear about your car; mine is automatically changing the channel. Annoying as well.